If you are wondering if getting free money from the Federal Government by getting government grants is a realistic and true way to make money and profit by knowing what other people don’t know, then read Free Government Grants For Moms Dads Business and Others. You may also be interested in other personal finance tips and advice. If you are already convinced that you can go out there and get your share of this multimillion dollar giveaway from the Federal Government just by finding and winning grants from the government, then read on. Notice that it is dot GOV and not dot com. If grants.gov is not your top search result, then you got a little too fancy with your search. Remember that nobody pumps up the real government grants webpage. There is no profit in that. If you want to shortcut the process, you can just trust me about the website and go to grants.gov directly. While the Federal Government Grants webpage looks simple, reading a little bit of what shows up on the screen should convince you that this isn’t as easy as it looks. If it was, everyone would be doing it, right? 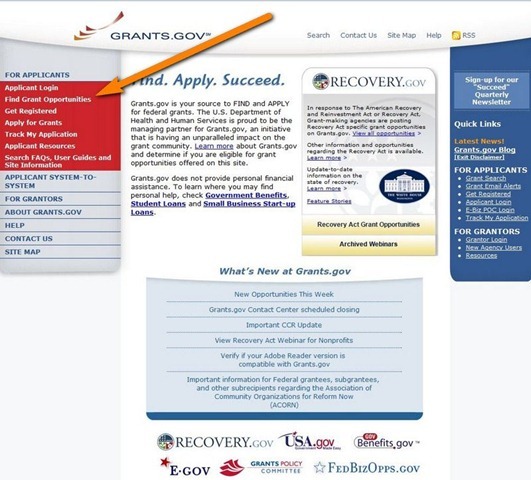 You’ll notice that the Grants.gov website includes not only regular government grants that they have all the time like grants to business owners, minorities, women, and for enterprises in specially designated area, but also all of the Federal Government grants from stimulus funds issued by the American Recovery and Reinvestment Act, or Recovery Act. So, whether you are looking for normal grants or stimulus spending grants, they are all here. Getting started finding grants can be tough. The Federal Government is very big after all, and they do offer TONS of government grants for all kinds of things from numerous government agencies. Now, the whole key to getting big money from the Federal Government in the form of grant money is to find which grants that you can qualify for. To find the grants that you qualify for, use the different search options in the middle of the Find Grant Opportunities webpage. If you don’t know what government grants you qualify for, start by choosing either Browse by Category, or Browse by Agency. These choices allow you to dig through the thousands of government grant programs to find the ones that fit you. As you look through all of the many, many, available grant opportunities, make some notes about which ones you qualify for. With so much grant money available from the government, it might be hard to find the best grants again later. For example, under Browse By Category, there are government grants for Business and Commerce, the Environment, Health, Education, and even the Arts. Also, there in the right hand column is the listing of all the new grants created by stimulus spending, and triggered by the Recovery Act. If you couldn’t find very many grants you qualify for (or if you did not qualify for any of the many government grants you saw) keep reading this series on Getting Government Grant Money for further tips that might help you find more grant opportunities. 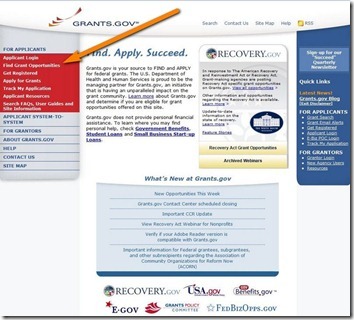 Remember, these grants are given away by the Federal Government everyday, but only a select few are willing to learn how to find government grants, how to apply for government grants, and then how to win government grants.